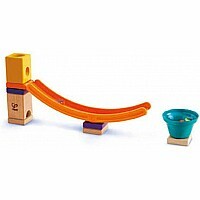 Give your marbles some serious air-time as they shoot out of this high-speed jump and off the Quadrilla run. Can you get more than one in the air at once? As each marble lands, the bell funnel will chime to celebrate a successful landing. Helps to develop spatial thinking and an understanding of Science, Technology, Engineering and Mathematics (STEM) principles. Praised by The Wall Street Journal as the perfect toy for teaching children how to code. Compatible with all Hape Quadrilla sets. For ages four and over. Measures approximately: 7.09 x 3.15 x 11.81 inches..